Iowa City, Iowa - The man who will serve at least temporarily as the nation’s top law enforcement official is a relatively inexperienced Republican Party loyalist from Iowa who has called for limiting special counsel Robert Mueller’s investigation. 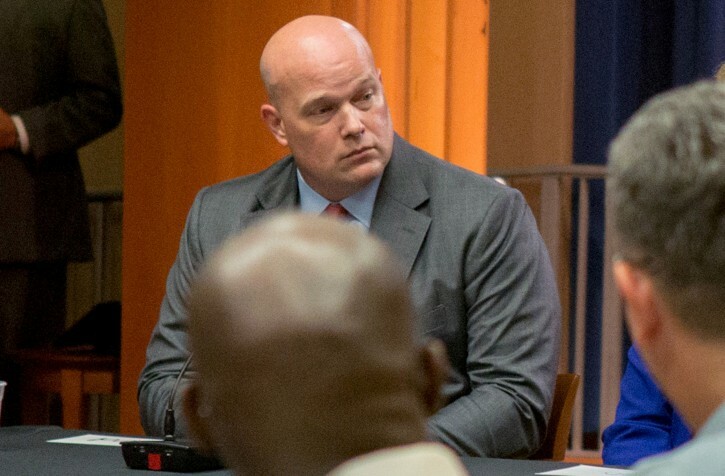 Matthew G. Whitaker, 49, will become the nation’s acting attorney general following the forced resignation of Jeff Sessions. President Donald Trump announced the appointment Wednesday, saying on Twitter that Whitaker “will serve our Country well” and that a permanent attorney general will be nominated later. He was never elected to anything. He never served a day in uniform. It seems he never had a job outside of government. Another inside-the-beltway swamp creature. Hmm so why did trumpf wait till AFTER the election to fire Secessions? Vause he knew there would be a huuuge backlash against him and GOP. Anti-democratic move, against separation of powers, impeachable offense. READ THE CONSTITUTION (if you can find one). Until he investigates Fusion GPS it leads back to Clinton, Holder, Lynch, Obama and the rest of the criminals had occupied the white for 8 failed years. They will all need to be fitted for orange jumpsuits. As usual, you don't know what you're talking about. Of course he will. It is like a prerequisite if you are a republican. Engage in a multi-million investigation of Clinton or someone associated with them which concludes with no indictments, unlike what has been happening with Trump associates (under a GOP controlled White House, Senate, and House of Representatives)... Hmmm, come to think of it, with a House controlled by Democrats which can subpoena all sorts of goodies, would not be surprised that the prisons start filling up fast. Btw, Trump's returns will be requested by the House and I suspect the committee will decide to publicly release them. Will be looked at by many citizens some of whom will be able to point to issues in the returns that the IRS would not realize. Should be fun. No wonder Trump is raging. Yup lyin Paulin aka yamsar . He is as honest as you . But we don't care . His experience or swampness doesn't bother us . We want him to make muller life difficult. You see this Russian collusion thing is one fat lie . But these wicked prosecutors get away with stupidity like finding a small gottcha obstruction of justice moment just to fry someone . Our justice system is corrupt And so call him what you want we don't care . His job will be to limit mueller . And that's all we want . Got it yoni ? Yamsar ? White supremacist anti-semitic guy who isn't even a lawyer becomes the highest ranking law enforcement official in the country. How come you had no problem with Eric Holder being tied at the hip to hisboss Hussein Obama. Your prejudice is really nauseating. I am sure you never read the Constitution because this is NOT an impeachable offense. The President is in charge of the Executive Branch and he has the power to fire anyone in the Executive Branch but to you liberals the truth is really not important. Maybe your buddies Schiff and Feinstein should be investigated as leakers and liars.